Bounty hunting is not an easy job. Neither the good guys or the bad guys trust you, and if you want the really big paying jobs, you gotta go after the really dangerous targets. Boba Fett doesn't think about any of that though. He just needs to know a name, a price, and whether or not he can disintegrate the target, and he'll take it from there. After all, Fett's got a reputation for getting results, not for being chatty. If you're dressed up as the infamous bounty hunter, you'll need to look like you can get the job done, too. When you're wearing this Deluxe Boba Fett Collectible Helmet, no one will question your ability to bring your quarry in! This licensed high quality costume reproduction looks just like the helmet worn by the Mandalorian mercenary in the Star Wars films. The hard molded plastic construction will hold up to costumed adventuring, and the targeting eyepiece flips down just like the real thing. 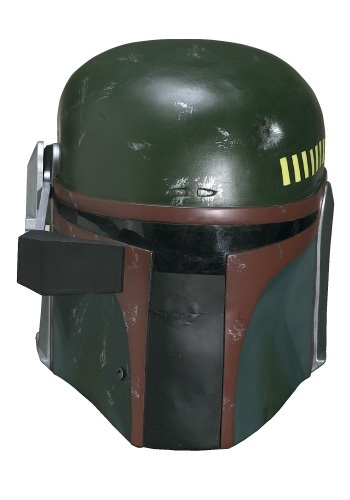 It's the perfect headgear to wear with your Boba Fett costume, or any occasion that you feel could use less talking, and more action!